Having been on the wait list for accessible housing for three years, Stephen was looking for the necessary support to guide him in the right direction. As an NDIS participant supported by the Brotherhood, Stephen met with Linkage Coordinator Amanda Berry to discuss the next steps in pursuing his goals for the future. Stephen described his struggles in obtaining appropriate housing and the barriers he faced. Amanda connected Stephen with AMIDA, an advocacy group that specialises in housing for people with disability. AMIDA was able to advocate on behalf of Stephen in relation to gaining suitable housing. This support combined with the encouragement of his Linkage Coordinator Amanda, helped Stephen to develop the confidence to pursue his goal of continuing to live independently in a home modified to his needs. 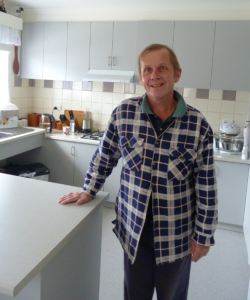 As a result of Stephen’s increased capacity and the support of his networks, an accessible property that matched his needs became available in late May. The three year wait was finally over. After the first inspection of the unit, Stephen knew he had found the right fit. “I didn’t hesitate to say yes to the property,” he says. Stephen moved into his new home shortly after the first inspection. He’s now living with a friend and is looking forward to exploring his new community. Stephen in his new kitchen which has been modified to his needs. Having overcome a number of barriers to securing accessible housing, Stephen now wants to use his experience to support others with disability in similar situations. “I feel very grateful to have this property, knowing that there are also others in my position who haven’t been as lucky,” Stephen says.